I have abhorrence for people who spend their quality time criticizing others. It seems they have nothing worthwhile to do other than wagging their tongues in bitching and backbiting. On our arrival here, in the very first week we met a couple who happens to be a colleague of my hubby and whom I met for the first time. They began the conversation making crude remarks about people I was yet to meet; my hubby's other colleagues and their families. It very rarely happens with me that I develop an instant dislike for people at the very first meeting because I don't come into any conclusion about people unless I know them well or have spent a generous amount of time with them. It just occurred to me that if the couple so frankly engaged in censuring people whom they hardly know for few weeks in front of me, who was a total stranger to them, they might do the same about us to others. Can these sorts be ever trusted? No, absolutely not. This nosy and gossipy kind creates rifts among people and it is better to shy away from them. 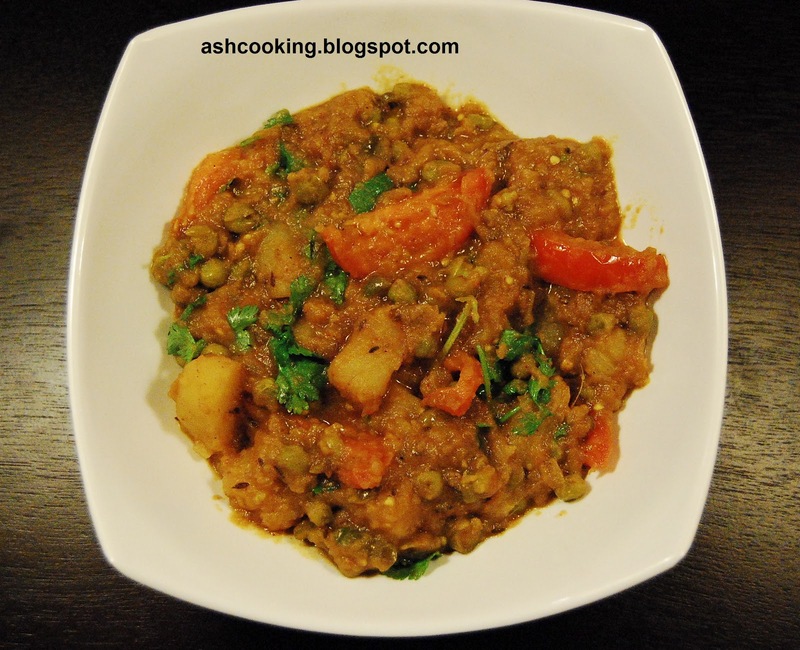 Coming back to the recipe, this aloo mutter masala curry is my favourite and one of the recipes which I picked up from a North Indian friend while sharing meals at luncheon. 1) Heat oil in a wok. When oil turns smoking hot, add the ingredients for sauté and allow them to sizzle. 2) Add the onion paste and shallow fry till onion changes color. Add ginger-garlic paste followed by the spices - turmeric powder, cumin powder, coriander powder, dry red chilli powder and dry mango powder. Sauté for couple of minutes till oil floats on the surface. 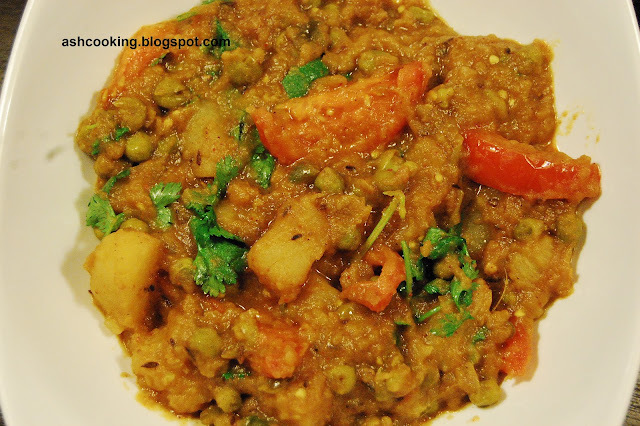 3) Add the potatoes, green peas and the green chillies. Combine well. Add 1/2 cup of water and simmer away till potatoes soften. 4) Add salt and sugar. Cook for 1 minute more. 5) Finally sprinkle garam masala powder on top and add the tomato wedges. Give a good stir. Turn the heat off.